Description:In a letter dated April 1906 Mr. W. B. 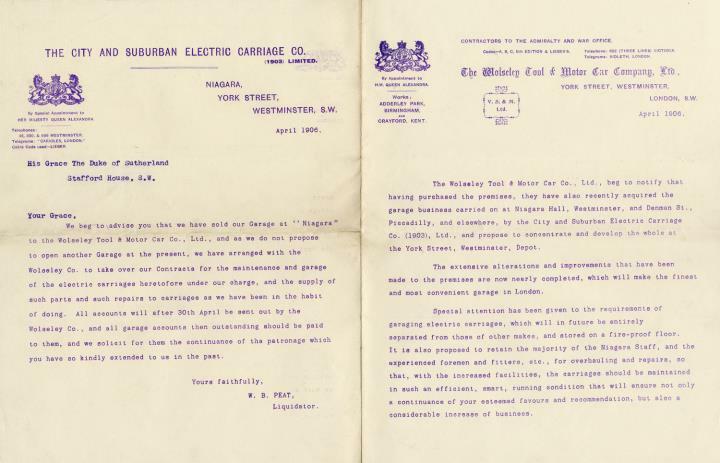 Peat wrote to the Duke of Sutherland to inform him that ‘The City and Suburban Electric Carriage’ company’s “Niagara” garage was being sold to the ‘Wolseley Tool & Motor Car Co.’. 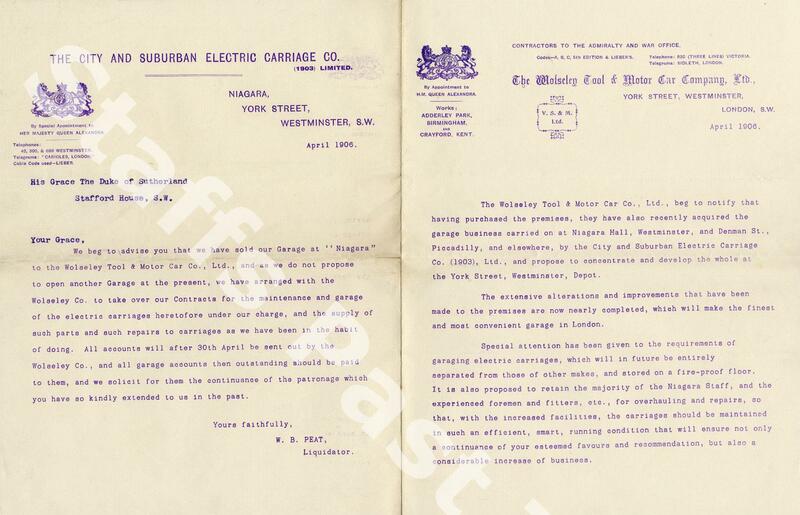 The letter notifies the Duke, who was a customer of the garage, that the original maintenance contracts held by the Electric Carriage Company would be taken over by the new company and that the accounts would be changed accordingly. The letter also notes that the ‘supply of such parts and such repairs to carriages’ would continue as normal. On the back page of the letter is further detail regarding the takeover by the Wolseley Tool & Motor Company which involved a number of garages located in Piccadilly and elsewhere in London. The aim of the takeover was to ‘concentrate and develop the whole lot’ at the company's newly refurbished York Street depot. The letter remarks that this was soon to be ‘the finest and most convenient garage in London’. The further information supplied by the Wolseley Tool & Motor Car Company also assures the Duke of Sutherland that the majority of the staff from the “Niagara” garage would be retained and that this, coupled with the new facilities, should warrant both the Duke’s recommendation and a ‘considerable increase in business’.